We moved to southern California for the year-round sunshine, Pacific Ocean beachfront activities, and unlimited opportunities for adventure, but with two cars and no access to a truck or SUV it can be difficult hauling sports equipment to the beach or local hot spots. Our first purchase, before we even owned a couch, was a surf board. We needed something large since we were beginner, or worse, surfers and hauling around the board proved to be a difficult task let alone getting it strapped to the car. Now that I’m pregnant, surfing is out for a few months but I miss the ocean terribly. I needed an activity where I could still be on the water but I didn’t need to worry about causing stress on the baby. I want to cruise the Pacific Ocean in comfort without hauling along a huge surfboard, paddleboard, or full-size kayak. 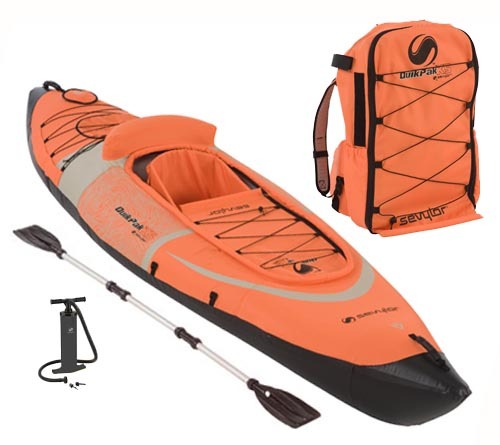 The Sevylor QuikPak K5 inflatable, backpack kayak is the grab-and-go kayak. Portable and lightweight with an integrated backpack storage system, the QuikPak easily folds up into a backpack and fits into the backseat or truck of our car. Darren can easily transport both kayaks and we can enjoy a relaxing afternoon in the marina without worrying about transporting or carrying the kayaks. Gone are the days of longing to be on the water! With the QuikPak, I can still enjoy the Pacific Ocean at my own, pregnant pace. Then, when our precious cargo arrives, we still have top-of-the-line, durable, portable kayaks; it’s the best of both worlds. When we arrived at the marina, we just unpacked and inflated the kayaks and we were ready to go! The 1-Person QuikPak holds up to 250 pounds, not that I’m there… yet, and measures 10′ long by 3′ wide. It’s durably constructed of 900D polyester on top, and 1000D x 1000D polyester laminated with 24-gauge PVC on bottom. There’s room for our gear, or food, within the storage area, multiple D-rings, and bungee lacing. A spray skirt provides protection, while tracking fins make for easier steering. A paddle is included, as well as a dual-action hand pump for inflation (although we chose a 12V pump so we could avoid hand pumping). It’s guaranteed not to leak thanks to Sevylor’s exclusive Airtight System, and the boat’s Double-Lock and Mini Double-Lock Valves prevent accidental air loss and ensure quick, easy inflation and deflation. Other features include handles for easy boarding, which are critical at this stage of my pregnancy, a built-in footrest, and a mesh carrying/dive bag. Darren inflated both kayaks within 5 minutes and positioned mine near the water so I could hop in without difficulty. I used the handles to position myself and gently slide into the kayak. Even with my growing, pregnant belly, I comfortably fit! Although a paddle is included in the package, we chose anodized kayak paddles to make the entire process as easy and enjoyable as possible. With little effort, I was off into the water and enjoying the beautiful California weather. The spray kit kept me dry and the tracking fins made steering a cinch. After two relaxing hours of floating, paddling, and eating a few little snacks, I was ready to return to the shore. I didn’t think I would be able to play in the water again until after the baby arrived, but the Sevylor QuikPak made it possible. Needless to say, I highly recommend QuikPak to anyone looking for an inflatable kayak. It contributed to my endless wanderlust by gliding through the Dana Point Marina, letting me explore the waterways once again. You can pick up a Sevylor QuikPak for $349.99 on the Sevylor website or on Amazon.com for $289.57! This entry was posted in Adrenaline, Adventure, California, California Outdoors, Product Reviews, Travel, Uncategorized, USA and tagged Adrenaline, adventure, backpacking, beaches, bucket list, California, Children, culture, Family, Inflatable Kayak, kayak, kayaking, landscape, Lesley Carter, life, ocean, photo, products, Sevylor, SoCal, southern California, travel, USA, vacation by lesleycarter. Bookmark the permalink. How cool and convenient is this?!! I know, right! So many people don’t kayak because of convenience and space, but this makes it possible for everyone. I don’t live in an area where I can go kayak, but this makes me motivated. Time to visit Southern California. Hi im henry. I go to a nautical ( boating ) school and one of the subjects on the curicullum is nautical studies where we get to go down to docks where we can do sailing or kyaking. kyackings very fun and exhilerating. Also have you done a spraydeck test yet. i passed mine last october. thanks for likeing one of my posts on my blog and i look forward to reading more of what you have to say. Really nice review. Thanks for this. Aha, kayak! That could be an adventure for the Viking and me! It’s perfect for your adventures. You can use it in the ocean, lakes, or rivers. I love that I can get back out on the water now. You’ll see a lot more posts in the near future of the beautiful California beaches. That is amazing!!!! A kayak in a backpack!!! I honestly never ever imagined anything like it! Good for you! I am now off to suggest this to my dad, who has wanted a simple kayak for years but has limited space. Or maybe I will just get it for him for the holidays….Thanks for the review! This is perfect for my father! Thanks for the info can’t wait to keep reading! That thing is awesome! How cool is that!? Too bad it doesn’t have an opening right in front of you to put the baby in when s/he comes :-). I’m sure I’ll figure something out so she can be on the water with me. Now that is a cool piece of kit! That is seriously cool! Thanks for the review. How cool! I want one of this! I’m going to search to see if they are available in Europe. Please be careful with you and your baby and don’t go to troubled waters. I remember you said it was due to march. Is almost there! I guess after all the adventures he or she has experienced with you al this months, sure will love adventures like you. It’s great to see your imagination to find ways to achieve your goals adapted to the progress of your pregnancy. Your’e amazing. The world needs people positive and full of energy like you. We stayed within the marina and avoided even lightly choppy waters. I was just happy to be on the ocean again. Its great that you can still find things to do being pregnant! You are going to be awesome parents with amazing stories and fun trips! Seems like a great product, so convenient! Since I became pregnant, I needed to think of new adventures that were suitable for each stage of my pregnancy. Kayaking is something that I can do daily as long as I stick to calm waters. It’s perfect! I love all the things you do. The only two I haven’t experienced are skydiving (which I would love to do) and bungie jumping-which I have had no inclination towards until your post. For people who are unable to afford to do these things, your writing actually puts them in the driver’s seat for the ride of a lifetime. Great job. Thanks. The most exciting will be the birth of your little human child….congratulations. I have been blessed with three and eight grandchildren! I can’t wait until my baby girl arrives. I look forward to experiencing new countries, cultures, and adventures with her, and my husband, at my side. I like your post, 20 simple “at your desk” exercises for web workers. Boy I admire that you are still going through all of this while pregnant. I bet you’ll fit into your clothes as you walk out of the hospital after giving birth. Nice article. Thanks for the encouragement, but fitting into my pre-pregnancy clothes will not even be close to happening. Not that I mind, but I’ve gained A LOT of weight. I look forward to being able to exercise again after she is born but it’s not a stress. I can’t wait to see what adventures you take your new baby on! I’m a fraidy can but I can live through your adventures. Lucky me. Thanks for sharing. Thank you for visiting my site and clicking like :-). Love your blog site too! Wish they’d had these ? years ago! Too cool! We bought kayaks last year. The hardest part is the transporting. This looks like it would work like a charm. 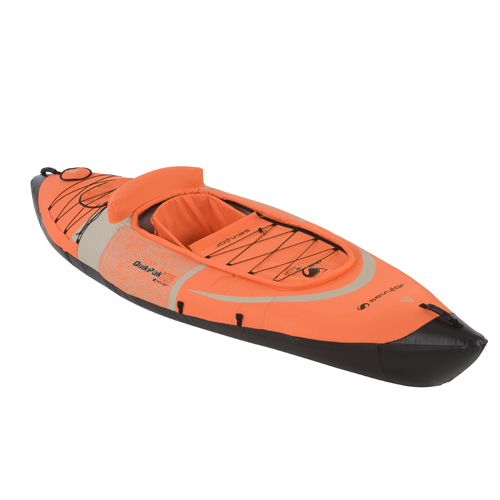 So great to know about these kayaks–and how relatively affordable they are. So very pleased for you that you are getting on the water again, safely and comfortably, in your pregnant state. A happy mother-to-be makes for a happy newborn! Wow, I am close to your age and haven’t visited nearly as many countries, although it’s something that I’ve contemplated and the sports fahgettaboutit! I’m not sure where to start with such a journey, but I’m glad to have been led your blog, perhaps its a first step nonetheless. What an inspiration you are! 🙂 BTW, thanks for your visit today. How amazing is that?! My little brother is rafting guide in southern Utah. He’s also an basement-renting college kid… He and his roommates have already overtaken the space with rafting and climbing gear. What a nice option this would be. 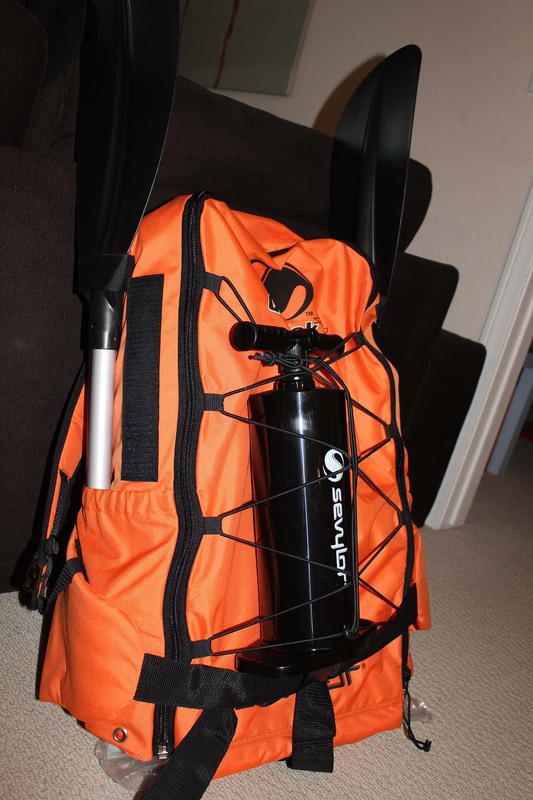 He’d actually be able to carry it around while backpacking along the Colorado River and then inflate when ready. Fabulous! ps-would’ve love to seen someone paddling along with a baby belly, haha. Cute. I don’t feel so cute with an extra 40 pounds but it’s all worth it in the long run. These kayaks are amazing. We always have space issues. Where do you kayak, right off of the beach? Now, I only like to kayak in the marina so there are no waves or worries of difficult waters, but when the baby is born, I’d like to get out on the ocean again. Hi Lesley! Thanks for your “Like” on my post today: “The Freedom Movement (Part 1).” I just posted Part 2 about half an hour ago. Check it out, everyone! Nice kayak. Great site. Lesley, Thanks for the hard work and effort you obviously are putting in to keep us informed! Wow – that is amazing! I soooo want a kayak but can’t envision storing one in my urban dwelling. I may have found my solution. Sure beats the plywood and convas “folding kayaks” that I made in high school! Those were probably bulkier than surboards. Love kayaking! Thanks for sharing! Wow this is great! Our Kayak often gets left at home because it’s hard to transport. Thanks for sharing. Is it stable in the water? This is really cool ! I want one ! While I live in a boring landlocked place, I gotta tell you, I love my kayak 🙂 (http://springrun.wordpress.com). I hope you have many awesome trips in yours! keep paddling! Wow! What a great idea! How do you think it would go with river kayaking (I’m thinking rocks and snags on the bottom)? I’ve seen ones which come into three pieces, but they are still quite heavy, and I would be a tad concerned that they might split up at a crucial moment. Best of luck with the bub! This is the coolest thing EVER, and Im totally down for getting one….. Great review!! this is so going on my wish list — nice post! You have your time to do it! Your great! I’m glad you found this kayak so you could have a safe taste of adventure! I love to hear that! Sevylor is a great company and I’m sure you will not be disappointed. Let’s see them build the kayak into a pair of swim trunks. Now THAT would be cool. Although possibly disturbingly bulgy. But that could be a selling point for some people I guess. wow! wish i could get this in india!